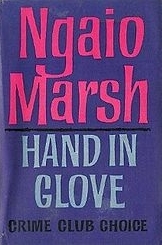 Hand in Glove by Ngaio Marsh ~ 1962. This edition: Collins (Crime Club), 1962. Hardcover. 256 pages. Prissy Mr. Pyke Period, elderly confirmed bachelor, delights in his comfortable life and in his reputation as a skilled crafter of charming epistles, in particular the exquisitely tactful condolence letter. Disturbing indeed to Mr. Period’s carefully nurtured savoir-faire is the discovery that his latest letter has gone somewhat astray, being delivered to the wrong party, whose loved one shortly thereafter turns up gruesomely dead, crushed to death under a sewer pipe in a drainage ditch right outside Mr. Period’s very window. Suspects include the tittering Mr. Pike, the murderee’s objectionably hearty sister, a pair of vaguely “Beatnik” young degenerates (Moppett and Leonard), Mr. Pike’s sprig-of-the-minor-aristocracy secretary Nicola, aspiring young artist Andrew, Andrew’s mother (Desirée, Lady Bantling, who also happens to be the murderee’s ex-wife), Bimbo Dodds (Lady Bantling’s third and current husband), and a few etceteras. There are minor red herrings and various complications, including a boisterous scavenger hunt to celebrate April Fool’s Day, during which the fatal event takes place, but it doesn’t take long for our detectives to zero in on the guilty party. Peace presumably now returns to the village. All in all, not one of Ngaio Marsh’s A-list, though, as with Agatha Christie’s oeuvre, even the B-list is readable. As with most of Ngaio’s books, Hand in Glove is mildly humorous throughout, which makes up for a lot. 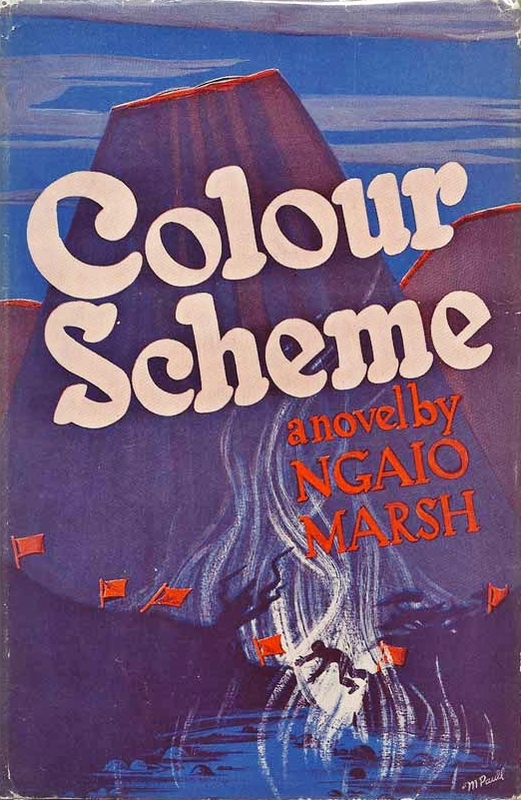 Colour Scheme by Ngaoi Marsh ~ 1943. This edition: Collins, 1943. Hardcover. 314 pages. I have found myself dipping into Ngaio Marsh’s mysteries a bit this year, with mixed results. 1962’s Hand in Glove, read for the first time this summer, left me cold. At least on this my first reading. Colour Scheme, on the other hand, pleased me quite a lot. Being a classic mystery novel by a deservedly popular author, and sure to be on numerous reading lists, I won’t give much away. Here’s the general gist, as set out in the first edition endpaper blurb. (M)ore a novel of character and character and atmosphere than it is a detective story. The scene is New Zealand, during World War II, the characters an ill-assorted, bizarre group of New Zealanders, Britishers and Maoris assembled in and around Wai-ata-tapu Hot Springs, a second-class thermal bath establishment belonging to Colonel Edward Claire. The Claires are a hardworking couple who have lost most of their modest inheritance in unsound investments. They have two children, Barbara, aged twenty-five, and Simon, twenty-one. The family has a genius for collecting impossible people, and at the opening of the novel are burdened with two: a seedy individual named Herbert Smith, who is seldom completely sober; and Mr. Maurice Questing, an unscrupulous business man to whom the Colonel is under heavy financial obligations. The final member of the household is Mrs. Claire’s brother, Dr. James Ackrington, an irascible physician living with the Claires as a paying guest and therefore completely free to criticize and complain. Before long there are two more additions to the establishment, Geoffrey Gaunt, the famous Shakespearean actor, and his secretary, Dikon Bell. Almost immediately Barbara is fascinated by Gaunt but at the same time Dikon Bell finds himself falling in love with her and Mr. Questing continues forcing his unwelcome attentions on her. The household are united in their dislike of Questing but at odds in practically everything else. With the first chapter one senses something queer and something very wrong, and the tension mounts as irritations and hatreds grow and as strange signals go out from the cliff above the sea. Throw in possible German agents, definite Nazi submarines prowling New Zealand shores, seething pools of fatally boiling volcanic mud, priceless Maori artifacts, an Eliza Doolittle scenario, an idealistic young Marxist immersed in the study of Morse Code, and oodles of artistic temperament. Result: a pleasantly nasty sort of Golden Age murder mystery.